Sunderland's superb end-of-season surge to safety ended in disappointing fashion against Swansea. 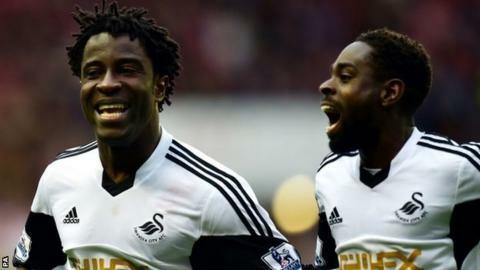 Nathan Dyer and Marvin Emnes struck for the Swans inside the first 15 minutes. Fabio Borini pulled one back soon after the restart, but Wilfried Bony restored the visitors' two-goal lead with his 25th goal of the season. Sunderland assured top-flight survival on Wednesday but victory was a fine way for the Swans to mark Garry Monk being appointed manager on a permanent basis. Black Cats chairman Ellis Short claimed his side had completed "The Greatest Escape" in his programme notes. But Swansea were evidently unmoved by their final-day hosts taking 13 points from five games, including wins at both Chelsea and Manchester United. Only six minutes were on the clock when Dyer sped into the box after Wayne Routledge threaded a pass inside Phil Bardsley, and the Swansea man clipped a neat finish beyond Vito Mannone. The visitors' second was Emnes's first goal of his second stint with the Swans, whom he joined on loan from Middlesbrough in January, and only his second of the season. Turning John O'Shea brilliantly after collecting Bony's pass with his back to goal on the edge of the area, Emnes drilled a powerful shot past Mannone. There was no great conviction about Sunderland's immediate response. Sebastian Larsson's cross was flicked onto a post by Jordi Amat and Bardsley's drive was tipped over by Gerhard Tremmel, but Gus Poyet's men made little headway. That changed at the start of the second half when Borini got his head to Adam Johnson's near-post corner, the effort containing too much power for Tremmel to keep out. Within a minute, the Swansea keeper was called upon again to keep out Johnson's fierce low shot. But Swansea soon restored their two-goal cushion as Emnes turned provider. The forward's cut-back rolled invitingly to Bony, who evaded Bardsley's tackle before his low shot went in off the far post. Sunderland tried to rally, and Johnson's low drive rolled just wide, although Tremmel appeared to have it covered, before substitute Jozy Altidore had a penalty appeal waved away by referee Chris Foy. But Swansea secured a first away win in this fixture since 1982 and, after 11 home defeats this season and with 10 players out of contract, a busy summer lies ahead on Wearside. Sunderland manager Gus Poyet on if he expected to be in charge in August: "You are scaring me now. What do you know that I don't know? "The rumours are natural. It is not only in England that you only have to do a little bit - not a big bit - for them (the media) start to say that you want to do this or that. I have a long contract and I am concentrating on here. On next season: "I do not like excuses. This year I have had plenty. But when you have a squad from the beginning, that is what you really want. On his squad: "Do we want to bring in another 14 players this summer? No. I know these guys. I know they can help me. If we can give them the right contract and right amount of money I will try to do that first. We should not be in a situation when all these players are coming off contract at the same time." Swansea manager Garry Monk: "This past three and a half months have been great for me. It has been a learning process and a taste of what is to come. "I guess from next season I will be judged more harshly on my own merits and every move I make. I accept that. I am not worried about it. It's how you have to live your life. "I am looking forward to being judged and being doubted. There is nothing better than trying to prove people wrong." Match ends, Sunderland 1, Swansea City 3. Second Half ends, Sunderland 1, Swansea City 3. Jonjo Shelvey (Swansea City) wins a free kick in the attacking half. Foul by El-Hadji Ba (Sunderland). Wilfried Bony (Swansea City) wins a free kick in the defensive half. Jordi Amat (Swansea City) wins a free kick in the defensive half. Nathan Dyer (Swansea City) wins a free kick on the right wing. Neil Taylor (Swansea City) wins a free kick in the defensive half. Attempt missed. Jonathan De Guzmán (Swansea City) header from the centre of the box misses to the left. Assisted by Nathan Dyer with a cross. Liam Bridcutt (Sunderland) is shown the yellow card for a bad foul. Foul by Liam Bridcutt (Sunderland). Attempt missed. Jozy Altidore (Sunderland) right footed shot from outside the box is high and wide to the right. Assisted by El-Hadji Ba. Substitution, Sunderland. Jozy Altidore replaces John O'Shea because of an injury. Fabio Borini (Sunderland) is shown the yellow card. Dangerous play by Santiago Vergini (Sunderland). Ben Davies (Swansea City) wins a free kick on the left wing. Attempt saved. Wilfried Bony (Swansea City) left footed shot from outside the box is saved in the top centre of the goal. Assisted by Nathan Dyer. Attempt missed. Fabio Borini (Sunderland) right footed shot from outside the box is too high from a direct free kick. Jack Colback (Sunderland) wins a free kick in the attacking half. Delay in match John O'Shea (Sunderland) because of an injury. Substitution, Swansea City. Ben Davies replaces Dwight Tiendalli. Substitution, Swansea City. Leon Britton replaces Jay Fulton. Attempt missed. Adam Johnson (Sunderland) left footed shot from outside the box is close, but misses to the right. Assisted by John O'Shea. Substitution, Sunderland. El-Hadji Ba replaces Sebastian Larsson. Attempt missed. Ondrej Celustka (Sunderland) right footed shot from a difficult angle on the left misses to the right following a set piece situation. Delay in match Fabio Borini (Sunderland) because of an injury. Jordi Amat (Swansea City) is shown the yellow card for a bad foul.